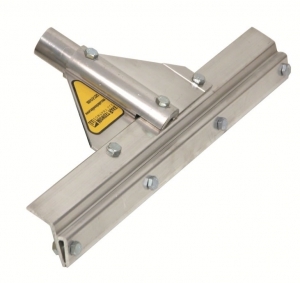 Application squeegee frames are the standard in the Protective Coating industry. These “clamp-style” frames make it easy to change blades. The unique gusset bracing and threaded handle adapter are the most durable on the market. The solvent-resistant aluminum frames are available with a with a threaded handle adapter. These are quality frames that can be used over and over again, requiring only the purchase of replacement blades. 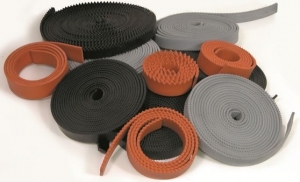 Application squeegee blades are available in Neoprene, EPDM and Red Rubber. The Neoprene and EPDM blades are “reversible” (notched on both sides). The Red Rubber blades are notched on one side and no-notch (flat) on the other side. Each type is available in a variety of head widths and notch sizes. 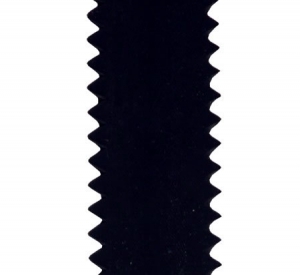 Neoprene blades are best for water-based or oil and petroleum based coating products. EPDM blades are best for solvent-based coatings and clear coats. The 2” Red Rubber blades are solvent- resistant and offer more flexibility in any floor coating application use. They are “non-marking” and display good solvent tolerance. This flexible 24” x 5” rounded corner steel blade is bent and angled to maximize blade contact with a range of surface coating materials. 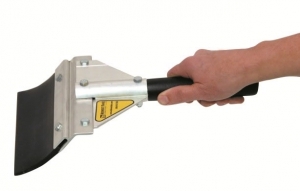 This smoothing tool can also serve as a spreading tool and even a surface preparation tool. It is most often used when troweling and/or smoothing overlay/underlay material (toppings) of a more cementitious composition prior to surface treatment. The blade is contained in a durable aluminum frame with our superior gusset bracing system. This tool comes with a threaded handle adapter. Straight blade smoothers are also available. The Magic Trowel is used to smooth the surface of applied cementitious overlays, particularly overlays of a more fluid consistency. A very effective finishing tool capable of creating a flawless surface. This tool is lightweight, yet durable. 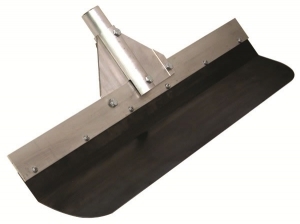 It features a 22” frame with a 23-1/2” x 2” heat-treated steel blade, fan-shaped for next to wall coverage, and a reversible “threaded” handle adapter assembly allowing for use as a smoother or spreader. Spread material with the blade in a vertical position.